Prime Minister Narendra Modi has been courting top American CEOs for his Make In India campaign since the beginning of his tenure –he’s been meeting them whenever he visits the country, and asking them to invest in India. And they seem to responding to his overtures. 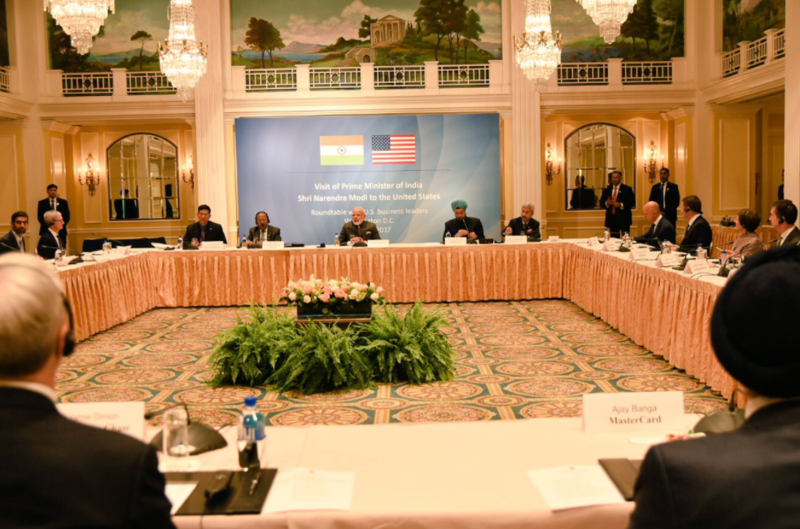 Modi met a group of 21 CEOs during his US visit, and they represented the who’s who of American business. Representatives from three of the five most valuable companies in the world showed up — Tim Cook from Apple, Sundar Pichai from Alphabet and Jeff Bezos from Amazon were all in attendance. 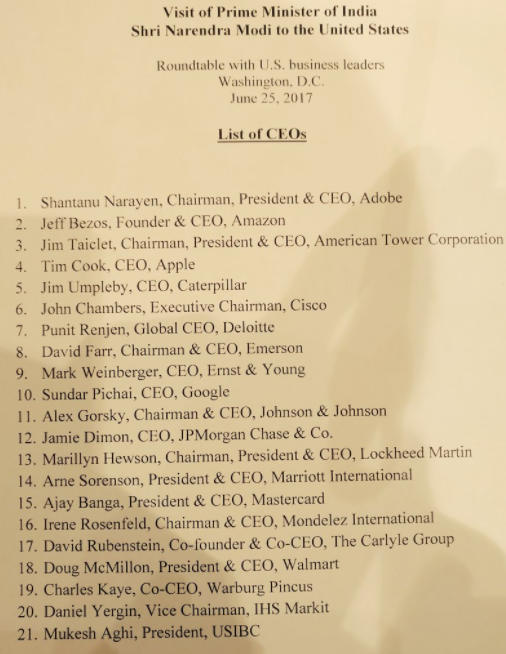 The guest list also included CEOs of Cisco, Mastercard, Johnson and Johnson, Adobe, Ernst and Young and Walmart, among others. The CEOs had been eager to meet with Modi. “Looking forward to meet with PM Narendra Modi,” tweeted Google CEO Sundar Pichai, and said he wanted to continue their partnership to bring technology to everyone in India. Google has been running several schemes in India, including one which provides free Wifi services at railway stations. During the 90 minute roundtable, Modi discussed a host of issues, including visas, investment and job creation. He also highlighted the achievements of the Modi government, and stressed on how it had made India a more investment-friendly nation. He focussed on the government’s move to introduce the GST bill in particular. “The whole world is looking at India. 7,000 reforms alone by GOI for ease of biz n minimum govt, max governance. Growth of India presents win-win partnership for India & US both, US cos. have a great opportunity to contribute to that. The implementation of the landmark initiative of GST could be a subject of studies in US business schools,” he said. And tech CEOs seemed pleased with what they’d heard. “Terrific meeting with Narendra Modi,” said Amazon CEO Jeff Bezos. “Always impressed, energized by optimism and invention in India. Excited to keep investing and growing.” Bezos had earlier committed to investing $5 billion into Amazon India, and it’s already seeing results. Amazon is fast becoming the biggest e-commerce site in India, pushing aside Indian rivals such as Flipkart and Snapdeal. Cisco Executive Chairman John Chambers called Modi “one of the great world leaders”, and said he was creating innovative outcomes for win-win partnerships between the US and India. Apple CEO Tim Cook said he was “inspired” by Modi’s vision for India. Sundar Pichai said he was impressed with the rollout of the GST bill. “Excited to see it happen ,shows you can achieve reform by pushing for it,” he said after the meeting. He said he was excited to invest further in India. The demonetization move was also hailed by the CEOs as a measure to counter black money, and they pledged support for Digital India and Make in India campaigns, the Ministry of External Affairs said.